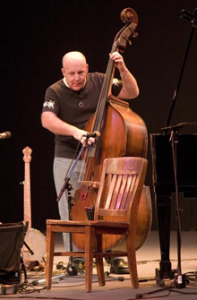 One of the most in demand upright bass, and five-string banjo players on the US contradance circuit, Stuart Kenney’s regional musical interests sweep from Southwest Louisiana to Acadia. He has a long career in many traditional music genres. His interest in Quebecois music formed through the fiddling of Lisa Ornstein, and performances by La Bottine Souriante. The inclusion of French Canadian music into the living tradition of New England contradance music caught his attention early on. In 1999, Stuart’s path crossed with Sabin Jacques and Rachel Aucoin at Augusta Heritage Traditional Dance and Music week. At that point, Stuart invited them to play for contradances in Greenfield, MA and they’ve been playing together ever since. Later, these three formed this group, Tidal Wave. Stuart is a founding member of many great bands including AIRDANCE, Greenfield Dance Band, The Sevens, Tidal Wave, and Undertoe. He spent 14 years touring with the legendary contradance band Wild Asparagus. Stuart is a much-in-demand studio musician as well with over fifty recordings to his credit. Stuart’s most recent project, Undertoe, is a musical collaboration with accordionist Karen Tweed (Yorkshire, England), John Dipper (London), and Marko Packard (US). He has composed many original pieces of music featured in their first recording Walking Down Angell Road. Although Stuart’s music has brought him coast to coast and beyond, his musical home is at the Guiding Star Grange in Greenfield, MA, where he plays for and hosts the TopHill Music and Dance Series.